When it comes to following trends in building and facility safety, it often pays dividends to get out in front of it rather than lag behind. This way, you are already where you need to be while others are scrambling to play catch up. This is particularly true when keeping the business or municipality you manage in compliance with state and federal ADA compliance laws. Though not yet required in all states, the New York City Department of Buildings (Local Law 26) now requires use of ADA compliant luminous signs. The local fire and safety officials believe the new ADA luminescent signs provide an array of safety benefits not available in signs that are either lighted by electricity or not lighted at all. So what are ADA Luminous Signs? Standard entrance and exit placards may meet minimum compliance regulations but ADA luminous signs are made of luminescent plastic materials manufactured by Rowmark LaserGlow™. These specially crafted materials enable the sign to be lighted even during power outages. 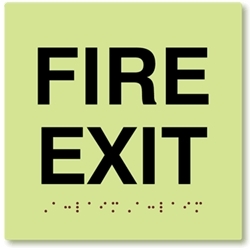 During a fire drill or emergency evacuation, building occupants are more easily able to find exit ADA luminescent signs because they will be naturally illuminated even if the power is out. This is a huge boost to everyone’s safety. ADA compliant luminescent signs are made to absorb both the natural and artificial light during the daytime. Then when it is dark, the ADA compliant luminous signage reuses this same energy to create a glow. It works similarly to glow-in-the-dark materials that are common on clothing and products for Halloween, except the ADA compliant luminescent signage is more durable, thicker and longer lasting. Other benefits of using ADA luminescent signs is that they are more energy efficient as buildings do not have to power them with electricity reducing energy costs. Moreover, the ADA compliant luminous signs require less maintenance as there’s no need to change the light bulbs or fuses, as they are self-preserving. So even though ADA compliant luminous signage may not be required where you live yet, it is worthwhile to think of installing them for your next building upgrade project to boost business safety and maybe even reduce operational expenses.